Welcome your guests and family with this metal wall mounted coat rack. A Charming piece to put in pride of place in your entrance hall or utility room. Reading 'Welcome' in black writing, it stand out against the painted white background which is trimmed with a painted, rustic border showing a look of rusty age. 4 hooks offer great storage for coats, bags and daily essentials. Looking great in any modern, shabby chic or industrial home. Welcome your guests and family with this metal wall mounted coat rack. A Charming piece to put in pride of place in your entrance hall or utility room. 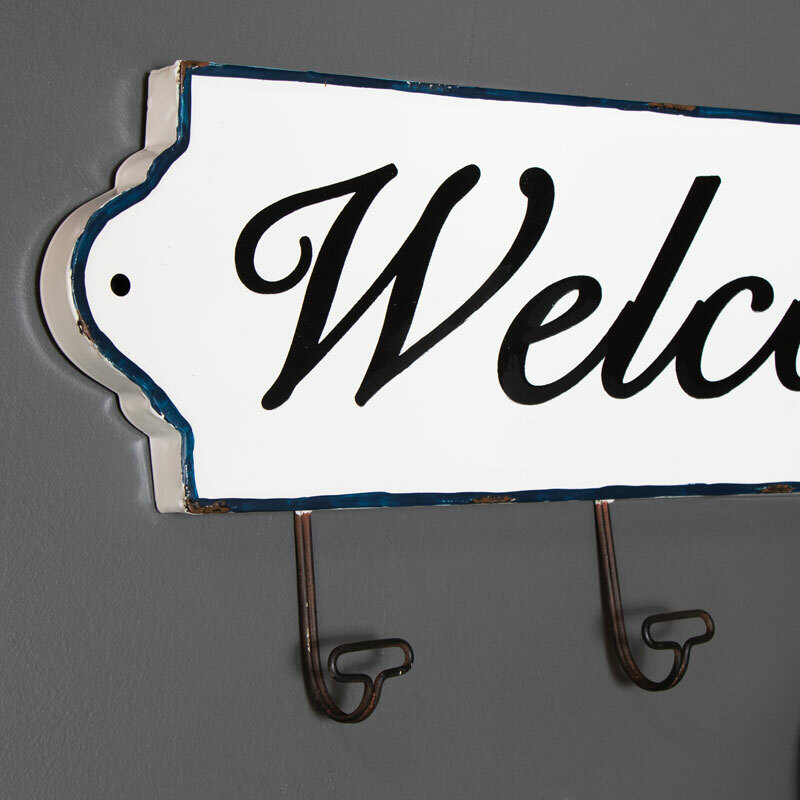 Reading 'Welcome' in black writing, it stand out against the painted white background which is trimmed with a painted, rustic border showing a look of rusty age. 4 hooks offer great storage for coats, bags and daily essentials. Looking great in any modern, shabby chic or industrial home. With a 16cm gap between each of the 4 hooks there is plenty of space for bags and coats. With two hooks fitted on the back it allows easy mounting on the wall. Please note fixings are not included but we advise using correct and secure fixings when mounting this.